As I sat at my desk on Monday afternoon, fretting about the layoffs and budget cuts that I face, I realized that I needed to feel part of something larger than myself, larger than my office, larger than the current state of the economy. So, I found a relatively cheap ticket and made my way to Washington, D.C. My goal was only to join the masses of people who are hoping for a better day. Once in D.C., where everybody knows somebody, I was able to get two silver tickets to the swearing-in ceremony. This stroke of luck simply confirmed that I was meant to be there. I woke up at 5:00am and left the house at 6:00am. Leaving from the outskirts of the city, I had no problem finding space on a Metro car. Even though I could feel the bodies of at least five people pressing up against me, I was not annoyed, not afraid, not at all uncomfortable. It felt like one big bear hug. Two Alphas on the train began a spontaneous game of Roll Call, singing out their names, hometowns and what they expected from the day. At first only other African-Americans joined in, but then the recognizable voice of an older, white southern man sung out, "My name is Bill and I'm from Kentucky. I don't know about ya'll but I'm feeling damn lucky!" There was a moment of silence before everyone cracked up laughing. After that, everyone joined in -- young and old without respect to race or class -- singing and rhyming and just feeling good. I fell out of the car at Judiciary Square and joined tens of thousands of people as they streamed beneath the Mall through an underground tunnel. It was a shortcut that normally would have terrified me. I reached the end and found the sun shining on a shoulder-to-shoulder mass of individuals moving forward like a flock of penguins. The anticipation, excitement and general good feeling was apparent even on the faces of the police officers. Gradually the VP seating areas were filled. And, amazingly, the VPs looked a lot like the crowds that filled the Mall -- they were Black, White, Asian, Latino, old, young, important, not so important, recognizable and mundane. I don't recall ever seeing this before. I was especially moved by the seating area closest to President Obama -- the family and friends area. Typically buzzing with WASPs, the space looked like a snapshot of a crowded street in New York City, Chicago or D.C. The faces were recognizable. They looked like my neighbors, my colleagues, my friends, my family. Anyone in America could look at that area and see a face that looked familiar. For me, that crowd was more than symbolic. It was a tangible reflection of America in the 21st century. It was a reflection of a change that has been happening for decades but is only now being acknowledged by those in power. Gordon asks, "What was so special about the inauguration?" What was so special was the synergy of feeling among those who attended -- a national synergy that eclipsed what was present in Grant Park by a thousand fold. Back in November, folks were still caught up in what could or should have been. White women, conservatives, Republicans, and old school haters were still entrenched in their petty grievances. On Tuesday, everyone was focused on the future and what will be. 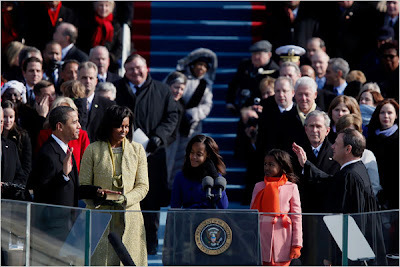 Even the Republicans in the crowd could not help themselves from smiling and joining in on this national celebration. In November, Obama as President of the United States was still not quite real. After all, Bush and his cronies were still in charge of the fate of the nation. After Obama was sworn in and Bush's helicopter took off from the Capitol, the crowd looked to the sky and without cue began singing "Nana na na, hey hey hey, GOODBYE!" Imagine, hundreds of thousands of people singing this at once. You could hear the joy and relief in the voices as the song rolled over the crowds. That exhale moment wasn't possible in November. Rereading what I have written, I realize that it doesn't capture an ounce of the feeling that I carried on Tuesday. All I can say really, is that I felt damn good and I have not felt that way in a long, long time. That was a lovely account. I still feel OK about my "consolation prize" at Grant Park and don't regret watching from my living room. have you guys checked out the horrible 'america' song? !